The South African Double-amputee, Oscar Leonard Carl Pistorius has been selected in the South African squad for London Olympics 2012. It took Pistorius over 7 years to convince the organizers that he’s good enough to compete with the able-bodied and the best athletes in the world. Until last week, it seemed he’d never see his dream come true as he did not get any response from the South Africa’s Olympic Committee. Yesterday, all of a sudden, they finalized his name for the 400m and the 4x400m in both relay and individual events. Born on 22 November 1986 to Henke and Sheila Pistorius in Sandton, Johannesburg, Oscar Pistorius suffered from a rare ‘congenital absence of the fibula’ in his both legs. When he was 11 months old, doctors decided to have his legs amputated halfway between his knees and ankles. His parents decided to raise him as a normal kid and encouraged him to play all outdoor games. Between the age 11 and 13, while attending Pretoria Boys High School, he played rugby union, water polo and tennis. In 2003, he incurred a serious knee injury and had to keep himself from sports for almost a year. 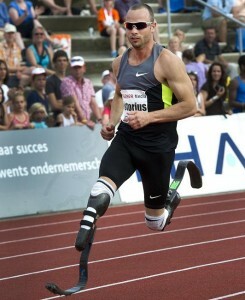 It seems Pistorius was destined to be a runner. In 2004, while undergoing the rehabilitation program, he started to walk and then run on the new carbon fiber blades. And he never looked back ever since. The same year, he participated in the 2004 Summer Paralympics in Athens and came third in the 100-meter event. He won the final in 200-meter event with a world record time of 21.97 seconds. What was remarkable about him was that he defeated single-amputee world champions Marlon Shirley and Brian Frasure. Popular as the ‘Blade Runner’, Pistorius drew worldwide attention in 2005 when he first competed against able-bodied athletes in 400-meters and with a record time of 47.34 seconds came sixth. Ever since, he has won several championships in both Paralympic Athletics and able-bodied Athletic events. This year, with his personal best 45.07 seconds and 45.20 seconds (in 400 meters) Pistorius had already qualified to participate in the Olympics. He was just waiting for the final call. 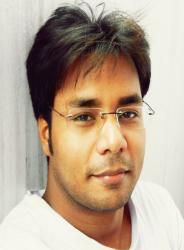 Team Success Stories wishes him all the very best! It’d be such a pleasure to watch him run in the London Olympics, 2012.